Containing 5 interchangeable filters, the V-IPL handpiece is compatible with all skin types and conditions with is PCR™ imbedded technology. PCR™ technology produces single to rapid pulses of varying degrees and durations that are ideal for performing hair removal, acne treatments, and skin rejuvenation procedures like cellulite removal, body contouring, and reduced visibility of stretch marks, hyperpigmentation, and vascular and pigmented lesions. The V-ST handpiece incorporated Viora’s renowned CORE™ technology to provide optimal results for skin tightening procedures. The hand piece comes with four RF channels – three individual levels and a fourth level that incorporates all three – to provide deeper penetration of the skin and better results. 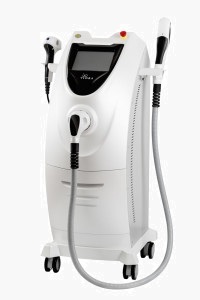 The third configuration of the Viora V20 is the V-FR hand piece embedded with the SVC™ (Swittching, Vacuum, Cooling) technology created by Viora that implements the use of RF technology to penetrate the skin and eliminate hyperpigmentation, acne scaring, severe stretch marks, and overall skin resurfacing. This handle is ideal for the use on the face, neck, décolleté, and hands while providing a painless and quick experience with visible results. or fill out the form below to request an appointment.